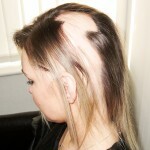 A beautiful and natural solution for hair loss caused by chemotherapy and cancer treatment in Belfast. “Losing my hair affected me most. Just complete our short form and we will contact you to arrange your free, no-obligation consultation in Belfast or at one of our nationwide salons. Alternatively, you can call us free on 08000 654501, or visit our website to find out more and why thousands of women choose Hair Solved. Please quote reference HS4 when calling.